Every so often I get into teaching dilemmas that makes me reflect or reconsider how I teach or how the studio is set up. In my last week at Snow Farm, I had a very interesting class that really challenged me. 2 students didn't want any hammering or the noise from hammering, and let's face it, it's kind of hard to make jewelry or metal art without some hammering. I kept having to think of ways to make metal more simple, less work, and more creative. I'm not sure how much more I can reduce metal down to a point that it is super easy to bend and shape and yet be very rigid in a very thin or delicate form. Sometimes you do hit the limits of the material and I was at the very limit of what I could do to keep metal extremely low tech. The other adventure I had during teaching, was to teach a soldering workshop at a bead store. I know what you are thinking, beads and soldering? I was hesitated to have soldering indoors in this lovely, airy bead store so I had the workshop outside on the lawn. Well, the lawn slopes, so all my tools and solder kept rolling off into the grass. With the sunlight, none of us could really see the flame in the soldering torches. On top of that, I got the worst sunburn since I was a kid. It got me to thinking, how can I have a portable soldering setup I can use, that is easy to transport, has all the tools and torch I need, and can be used anywhere. 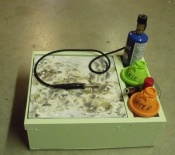 I thought of this simple box, using wood I had, and constructed this box, that has a 12 x 12 Solderite pad fitted into the top, a propane torch wedged into one corner so that it doesn't move, a pickle container and a water container. Under the Solderite top, there is space to put the tweezers and hand tools, flux containers, silver wire solder and anything else needed for soldering. Handles provide easy pick up and toting. It works great as a portable soldering station, and already I have students interested, so tentatively, price for a fully equipped soldering station would be $250. Everything is included, but you may have to buy the propane and/or butane from the local hardware store since gas tanks cannot be shipped. All in a neat little package under 20" long or 14" wide, and 6" tall. Last but not least, my most memorable memory of teaching is when I taught in a root cellar. It was one of the hottest, humidiest days of summer I recall, and I had to drive down this grass path to back of the gallery to unload my teaching supplies. When I saw the studio, I was pretty taken back for an uneven dirt floor, very old, ricky tables and chairs, poor lighting, and 7 students are confronting me. On top of that, my cochlear implant processor breaks down and I'm unable to hear. It was quite a day, and I somehow manage to teach everything. Let's just say it took a good 5 years before I came back to teach. This time, a proper floor was put in, better tables and chairs and more lighting. That building was built in 1927. Houses and buildings in New England tend to have weird basements/cellars/root cellars all in one. I've seen built in beehive ovens in colonial houses. I once lived in an old duplex house that had a bizarre basement that would scare the daylights out of me if I had to go down at night, and part of my studio was down there. I now overcompensate for that now in my very well-lighted, airy, open studio with more outlets than I need. All I need now are windows. Oh boy, the pains and joys of teaching, in all kinds of places. I've learned to bring everything but the kitchen sink to whatever new place I go.